I can't tell you how much I love my time spent art journaling. I love the feeling of leaving all of my heart, thoughts and emotions recorded in beautiful colors in my journal. I could be having the worst day ever and somehow the colors and feel of the paint soothes me and begins to transform my mood. My art journal takes me into a safe refuge of my own little island , a place to create and unwind from all life's worries. Art-ing in my journal just makes me happy. I started in high school ( I won't tell you how long ago that was) as a way of passing time. But it was just markers, pens and doodles then. It wasn't a thing like it has become in the last few years. I'm so glad it's evolved into the beautiful art form it is today. I've always loved drawing people ( and Charlie Brown characters) ... Which has also evolved over the years. I started a new journal for 2016... 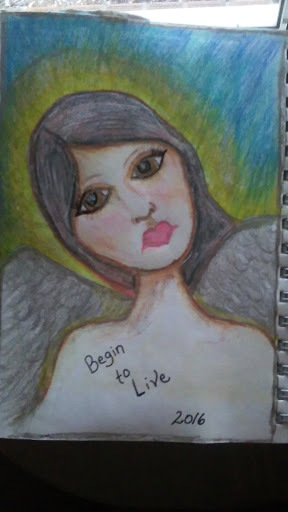 The word I've chose for this year is...LIVE... And this is my first page in my new journal. Prismacolor pencils for this and a Strathmore mixed media journal. This is my goal for 2016... No more just existing .... Its time to begin to live. To design a life I love. A life I cannot wait to get up in the mornings to start. I hope you will join me as I take this journey . if you haven't started Art journaling yet, now is a great time to start .